Wiltshire astronaut Tim Peake, is preparing to return home after a triumphant six months in space which saw him take part in more than 250 experiments, perform a spacewalk, run the London Marathon on a treadmill, and receive an honour from the Queen. We've been looking back at some of his best moments from his time in space. What's been your favourite memory? It is not every day that you get chased by a gorilla in space. But that is exactly what happened to the Wiltshire astronaut on the International Space Station. 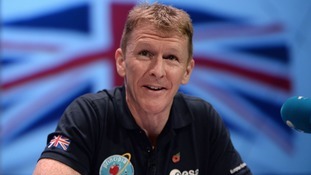 Major Tim Peake made a surprise appearance at the Brit music awards when he appeared live via the International Space Station to 'present' an award to Adele. Tim Peake cooks up a scrambled eggs storm! He may be 400km away from home, but that didn't stop the former pilot from enjoying a proper english breakfast at the ISS.